Rear mounting bezel removed to show internal components. 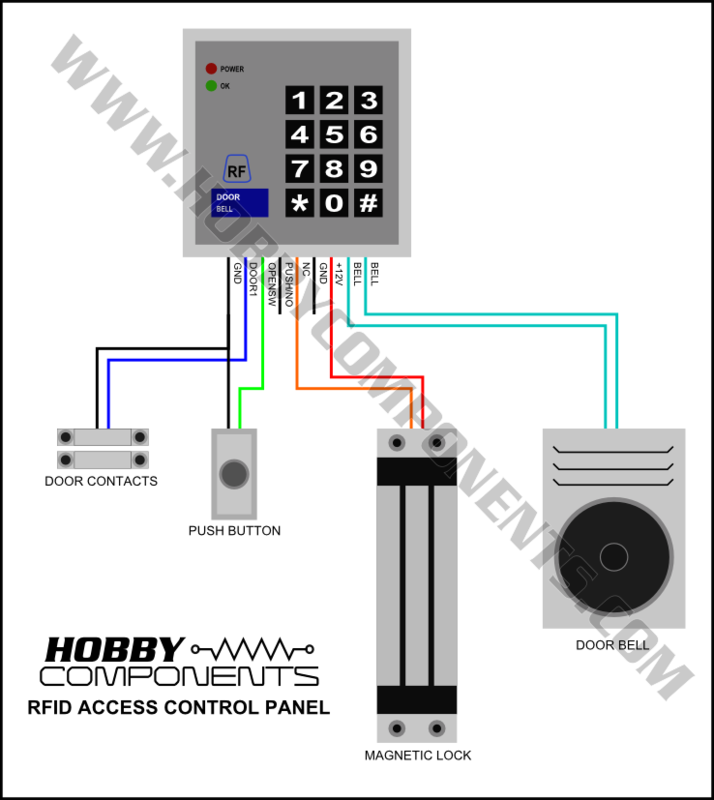 The Hobby Components RFID (ID) panel is a complete working door access security system that allows secure door entry using readily available RFID tags or cards for up to 500 different users. The panel can be programmed from the integrated keypad using a master code. 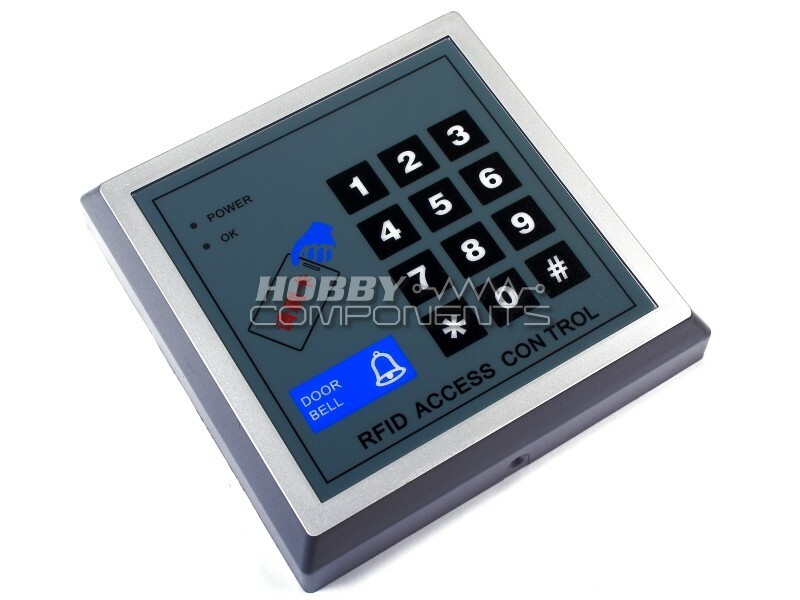 This allows adding and deleting cards & pin numbers and changing various setting such as door open times, door forced alarms, etc. An external 12V DC power supply is required which can also be used to power the magnetic/solenoid door lock which is to be controlled by the panel. A door sensor can be connected to the panel for monitoring forced entry and an external door chime can be triggered by pressing the door bell button on the panel's keypad. The panel isn't an open source product so I'm afraid schematics and source code aren't available. It does however come with an English manual showing how to program it. I'll be uploading another image to the first post shortly that will show the innards. That will give you a better idea of what's inside the panel. Hi, i have just bought one and i realize that i have to "show" the rfid key to enroll it. Can i enroll a key by presing the serial number as i have allways done with my old rfid panel (the same)? I'm afraid I don't know of any other way other than the method stated in the instructions. as i have allways done with my old rfid panel (the same)? Are you saying that your previous panel was the same model and it had this ability? andrew wrote: I'm afraid I don't know of any other way other than the method stated in the instructions. No, i had the same model but not purchased at hobbycomponents (or not recently, i really don't know where was it from). I could enroll the rfid keys entering key number instead of "showing". Nothing we are aware of I'm afraid. I've looked at the instructions myself and it seems that presenting the card to the reader is the only way to add key. Recently I have purchased the same from [URL REMOVED BY ADMIN] . Unfortunately I received a faulty product. It is not giving any audioable/ beep notifications. Can you please furnish the circuit diagram of the same so that I can check and rectify the same. As this is a closed sourced product I'm afraid a schematic is not available. If it's faulty I would suggest contacting the seller to arrange a return.